What if I told you that cancer, stroke, heart disease and many more conditions could be successfully operated on through a single pinhole-sized incision? It may sound like science fiction, but Interventional Radiology is removing the need for many traditionally invasive surgeries. Every day at my Sydney practice, I treat a range of problems using a tiny vein catheter, using imaging for guidance. Patients who once faced lengthy (and painful) recovery times can now be sent home the same day with just a Panadol and a Band-Aid. Personally, I think that’s pretty exciting. If you ever find yourself in need of surgery, you will too! Many people have never heard of Interventional Radiology. But the specialty is regularly breaking new ground to offer minimally invasive alternatives to open surgery for a wide range of problems. 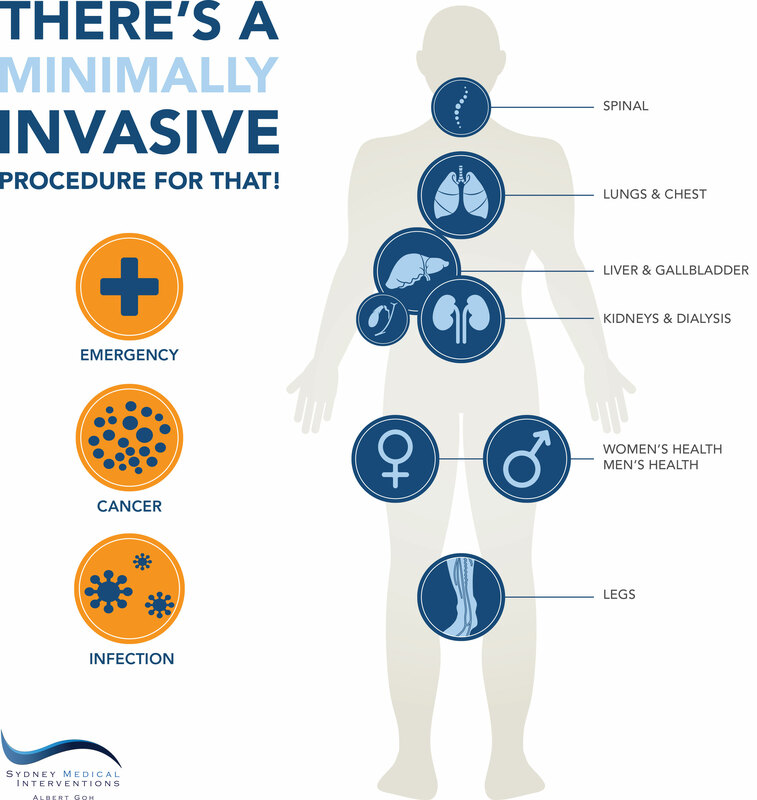 No worries – Interventional Radiology can treat all this and more. We can insert stents, fillers, and perform surgical procedures using X-rays, MRIs and ultrasound images for guidance. Interventional Radiologists undergo an additional six or seven years of training after medical school. We are highly trained in both radiology and interventional techniques, which enables us to look into the body and treat medical conditions using the most minimally invasive methods. Patients typically go home the same day as their procedure. This means cost savings on hospital stays and minimal disruption for busy families. Traditional open surgeries leave large wounds that carry a risk of infection. IR procedures are performed through a tiny puncture that only need a Band-Aid. The minimally invasive nature of IR means the body experiences very little trauma, and therefore can heal much faster than with open surgeries. Interventional Radiologists are always looking for ways to stop the chop! Instead of cutting the body, we use techniques that starve, shrink, freeze and otherwise deter problems from being an issue. No cutting = no pain! Diagnosis and treatment are performed using a tiny puncture that requires no stitches and leaves no unsightly scarring. Sydney Medical Interventions offers patients unparalleled clinical experience combined with in-depth knowledge of the latest minimally invasive treatments available. If you’ve got a pressing medical issue, or you’ve been recommended to have open surgery, knowing your options can improve your outcomes. Ask how Interventional Radiology can offer an alternative treatment option for your condition. Click here to book an appointment.